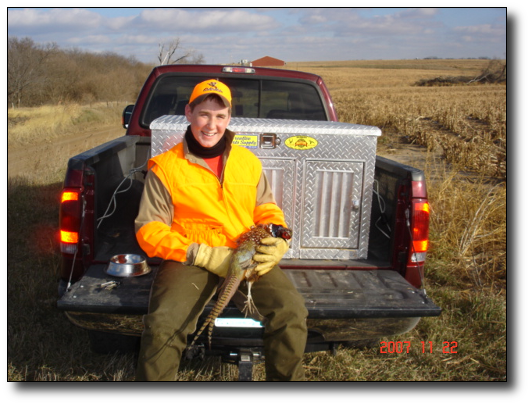 My two sons, Nathan, Dustin and I drove over to Kansas to a new spot that we had not hunted before and it had no history of anyone else hunting it. The trip started out with the traditional stop at the gas station to grab some of the world's healthiest doughnuts and coffee. Off we went with dreams of the elusive limit we always talk about before we start the day. I always tell my boys that I want to use the word limit in just one of my stories. As we arrive at the first farm we are a little concerned by the lack of cover but we are going to make this work. We get out of the truck and start getting the dogs and gear around. This trip we have a new dog that I had gotten from a friend that said "it just doesn't run big enough for horse back". I have been working with her and planned on letting her tag along on the check chord today to see how we do things. This is my second time having her out but the first with the boys. I hand the check chord to my son and ask him to hold her while I get the other dogs out. As I let the next dogs out I turn to see my son Nathan adjusting his hat, don't worry he has the check chord securely under his boot. Well as you guessed it, the first dog runs by and off they go. The new dog has now topped the hill and picking up speed. She hit the end of the section ran all the way back, crossed the road and headed down the next section. Did I mention there were cattle in the other section held in by a single strand of electric fence? By this time the cattle are chasing her, luckily she crossed a ditch and they stopped their pursuit. We loaded the two other dogs back up and headed to the end of the section where Dustin gets out of the truck to have the little dog come right up and greet him like nothing had ever happened. Well the new dog was put in back in the dog box and we continued to hunt this area and just didn't have much luck. We move on to the next area of the farm where we find a nice draw and a cut field of Milo. Still with not much of a mood to mess with the new dog we set out with our regular crew of an English setter named Deuce and a yellow lab Libby. This patch isn't very big and just hasn't done very well until we get to the back side where there is a grass slue at the bottom of the hill. Deuce is out in front of Nate and hits point. As we work our way over before sending Nate in for the flush. The birds begin to break. Hen! Hen! Deuce is holding beautiful. Well that just isn't right she isn't that good of a dog. Yep there were seven hens in that group and she was still on point. As Dustin is still coming up behind me Libby breaks into the cover and out comes a rooster. Before I could even turn to swing he drops the bird perfectly. Libby runs out and retrieves it back to him. I didn't even hesitate for more birds. I was so excited for him I had my gun on the ground grabbing for the camera before the dog even had the retrieve completed. 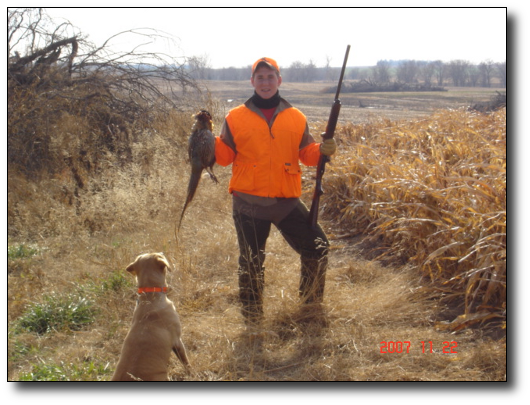 The real story here isn't that this is Dustin's first bird or Libby's first bird. 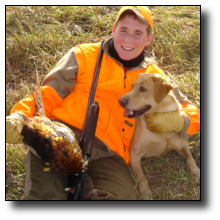 Libby is Dustin's dog and this is the first time his dog got the bird up, he shot the bird with out anyone else shooting to share bragging rights with and she retrieved it to him. This is why we do what we do, the complete package. I get excited and smile just writing this story 3 months later. We sure didn't limit out but we sure had fun.